This is a Fully Certified First Aid Course and is ideal for most businesses whose risk assessment has identified that there is no requirement for a fully trained first aider for their workplace. All courses are delivered by our very experienced senior Registered Instructors. All our courses fully meet the IHF (Irish Heart Foundation) and European Resuscitation Council Guidelines 2015 as per the HSA requirements. This 1 x Day Certified First Aid Course is also our most popular course for the majority of our customers and businesses and is sufficient to cover you and satisfy your requirements to comply with The Health & Safety Authority and the Law. 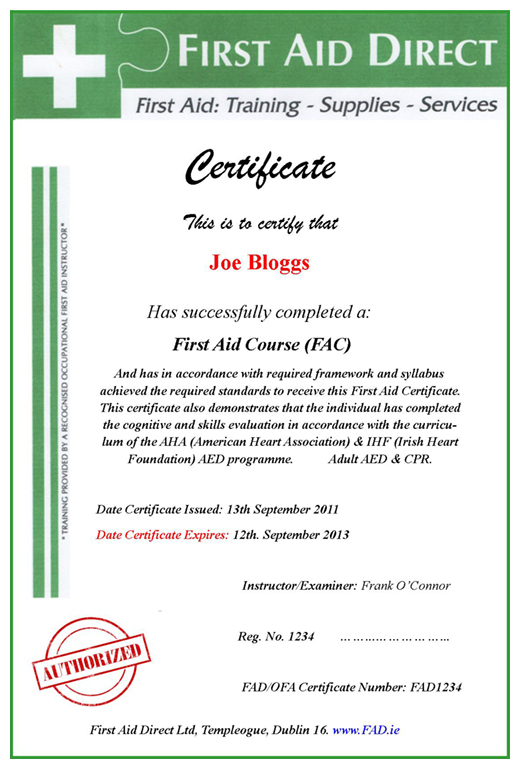 Fully Certified First Aid Course. To comply with the H&SA in your place of work. First Aid Training is a must for all employees, and every participant will greatly benefit from this certified course, particularly those in the care of others at home or in the workplace.